DUMBARTON stuttered to a disappointing defeat to fellow part-timers Cowdenbeath at the new renamed Dumbarton Football Stadium on St Valentine's Day. 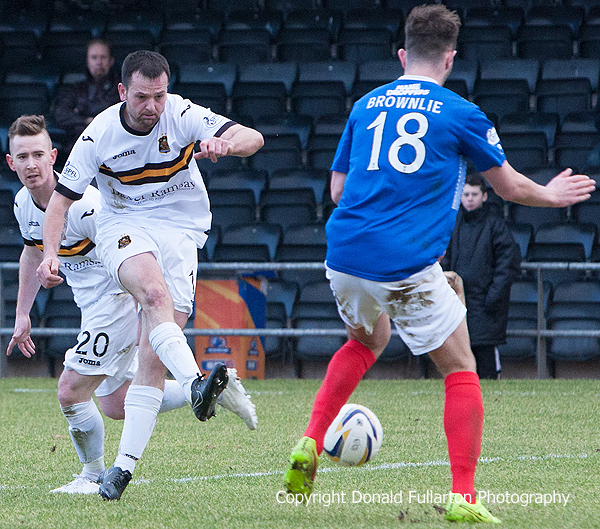 DUMBARTON stuttered to a disappointing defeat to fellow part-timers Cowdenbeath at the newly renamed Dumbarton Football Stadium on St Valentine's Day. A crowd of 756 saw the home side dominate in the first half, with Garry Fleming (pictured trying a shot) coming close on two occasions before defender Scott Taggart got on the end of a Scott Linton long throw to net the opener through the crowded defence. Sons continued to be in control for the early part of the second half, and when a penalty was awarded for a foul on Fleming it was expected that Scott Agnew would net from the spot for a 2-0 lead. But it was not to be. Keeper Robbie Thomson made a brilliant diving save — and it was to prove the turning point in the game. Instead of coasting to victory, Sons found themselves on the end of a barrage from Jimmy Nichol's men. A fine shot from Darren Brownlie levelled the score, then three minutes later Kudus Oyenga fired home a loose ball. The visitors stayed on top, but the home side had — but could not take — chances for an equaliser. The full-time whistle meant that the Blue Brazil, who included their new signing, ex-Son Colin Nish, moved three points closer to Dumbarton in the battle to avoid the bottom two positions.